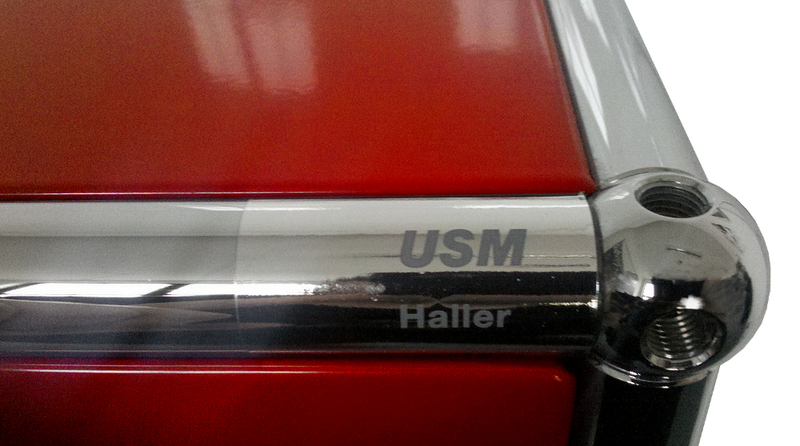 This type of USM Haller unit is particularly bulky/heavy. 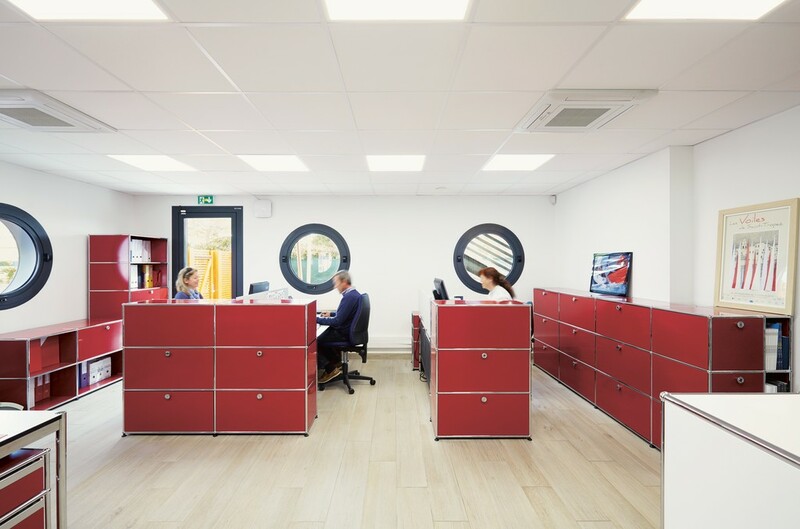 Only in exceptional cases, that is where the conditions at your location so permit, can such units be delivered fully assembled. 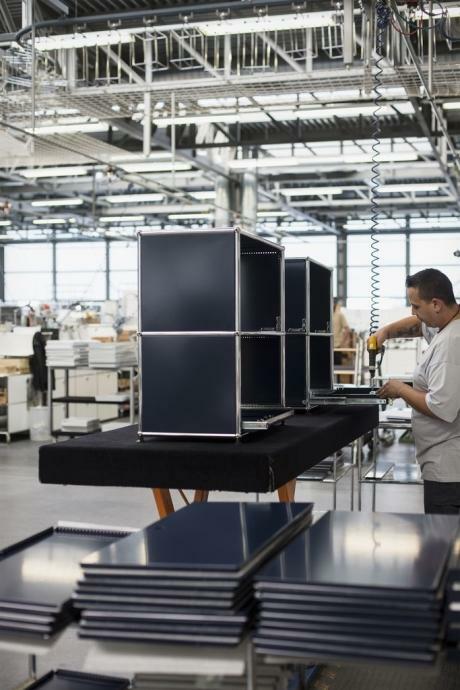 If this is not possible, the unit will be delivered partially assembled and final assembly organised "on site". In Germany the local assembly supplement is 149, - EUR + 2% of value of goods). For deliveries outwith Germany, and general questions regarding delivery options, please contact our USM Service Team. 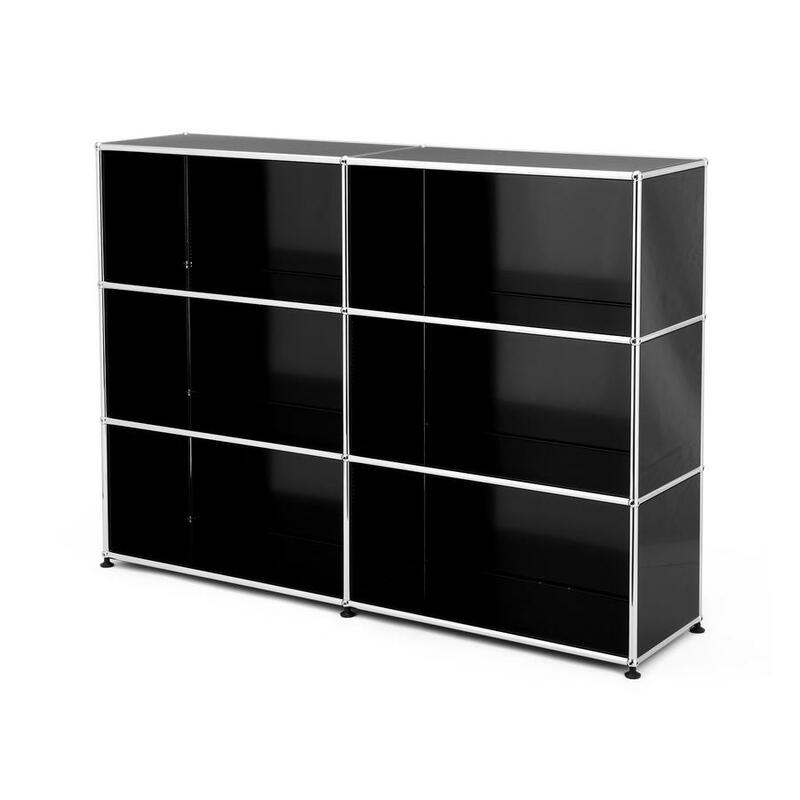 Will my USM Highboard be delivered fully assembled? 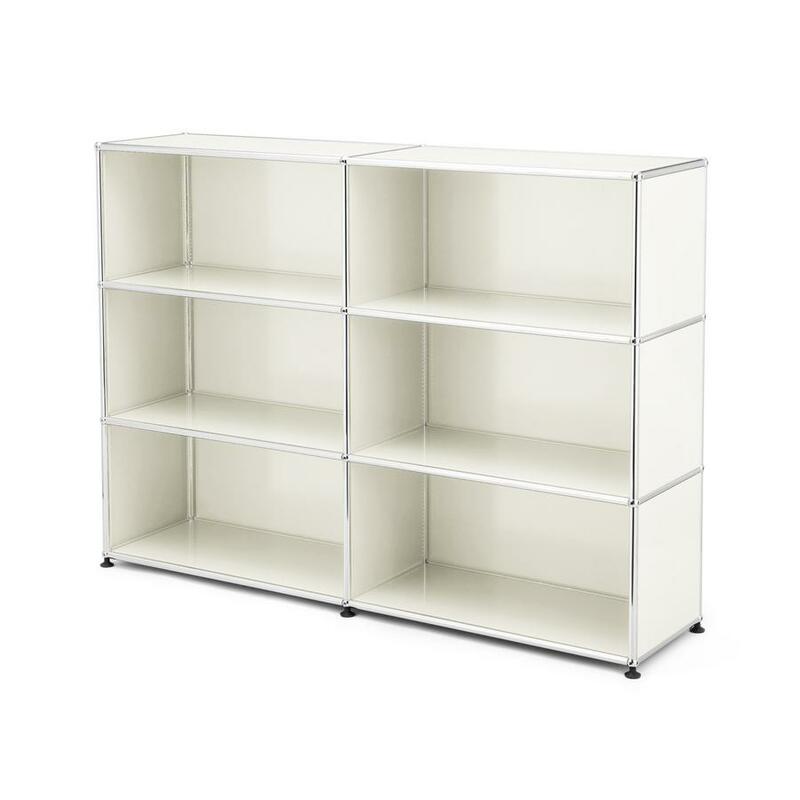 This type of USM shelving is particularly bulky / heavy. 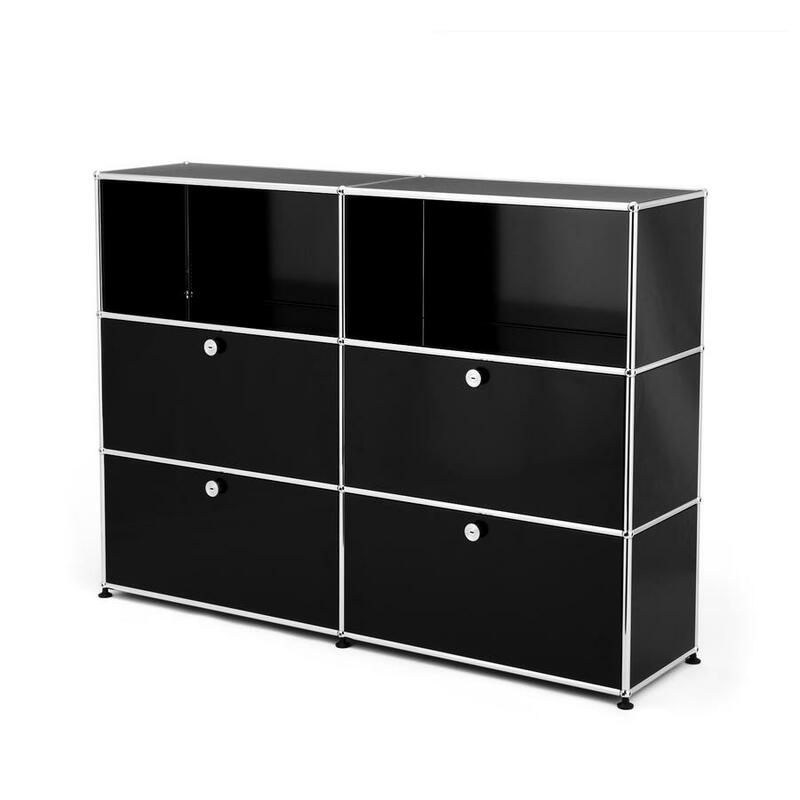 Only in exceptional cases can such units be delivered fully assembled. 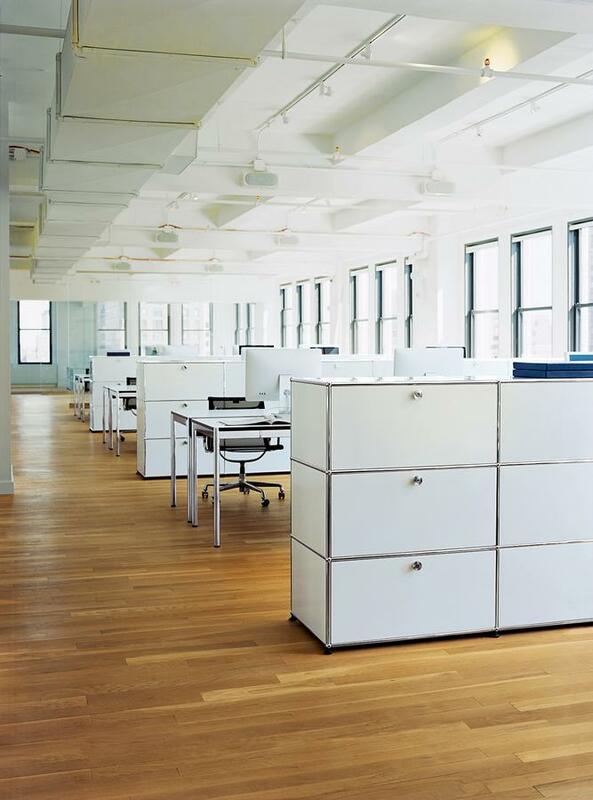 If this is not possible it will be delivered partially assembled and then completed in your premises. Please contact our USM Service Team for more details. Is the installation of additional drop-down or extension doors to an existing highboard possible? 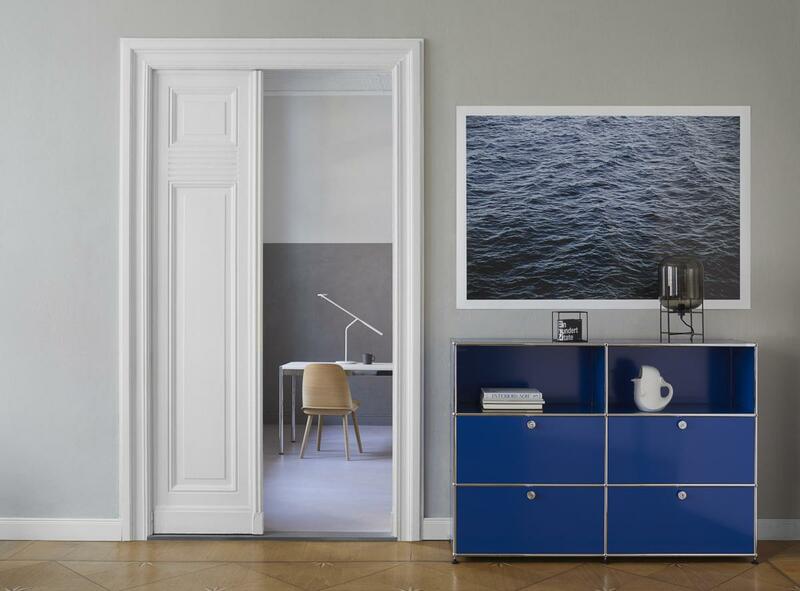 Because the USM Haller furniture system is a modular system a retrofit installation of doors is, in principle, not a problem. Drop-down doors can be added by anyone with minimal technical skills and the appropriate instructions. The installation of the extension doors is, in contrast, more complicated and as such should only be undertaken by trained technicians. Can I switch the position of the folding doors, e.g.. from the lower to the upper compartment? Such is possible at any time. 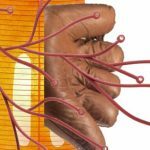 There are no special tools, and only minimal technical skills, required. 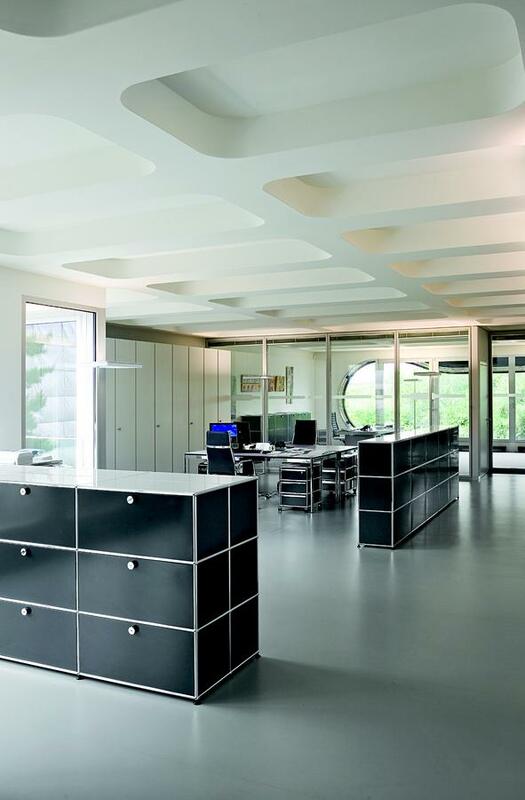 When in 1961 USM boss Paul Schärer commissioned the architect Fritz Haller with the planning of new production and office buildings he also requested a suitable solution for furnishing the interior. 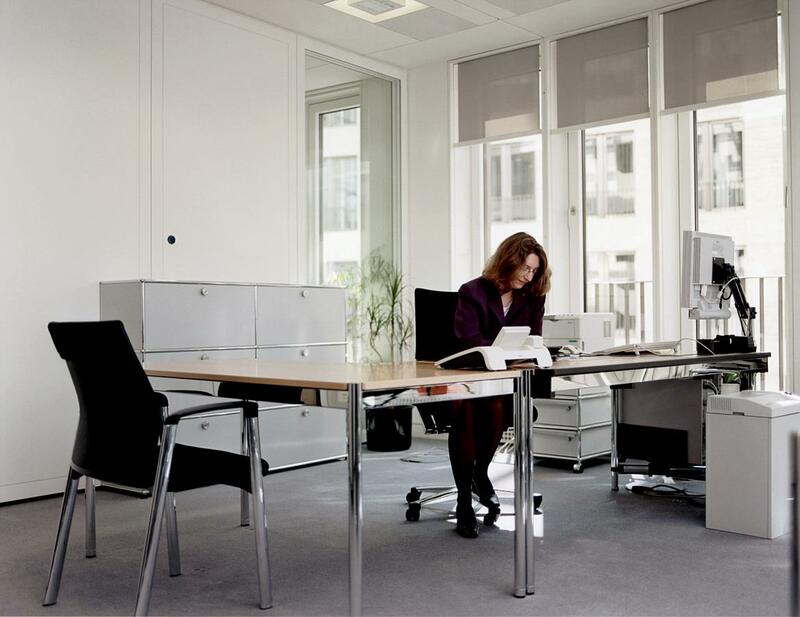 His idea was for a flexible solution which ignored design hierarchies within the company, a position which can be understood in context of the, then, new concept of open-plan offices. 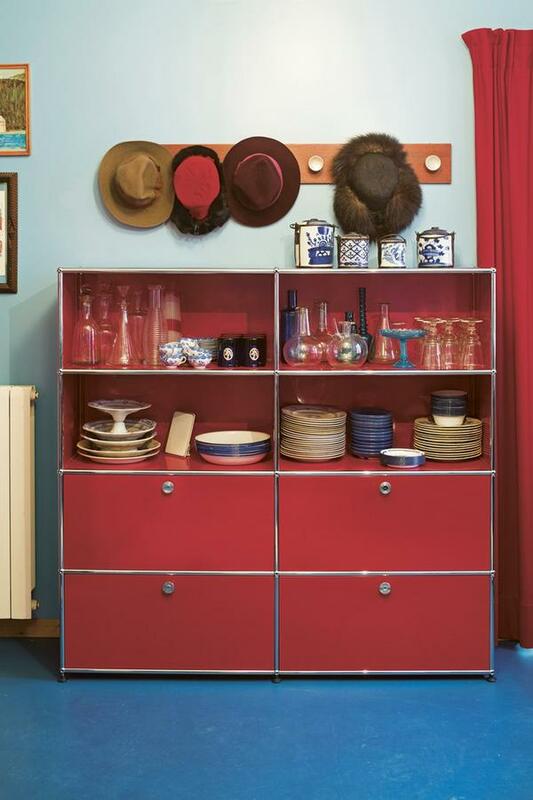 In 1963 Fritz Haller presented his new modular furniture system. 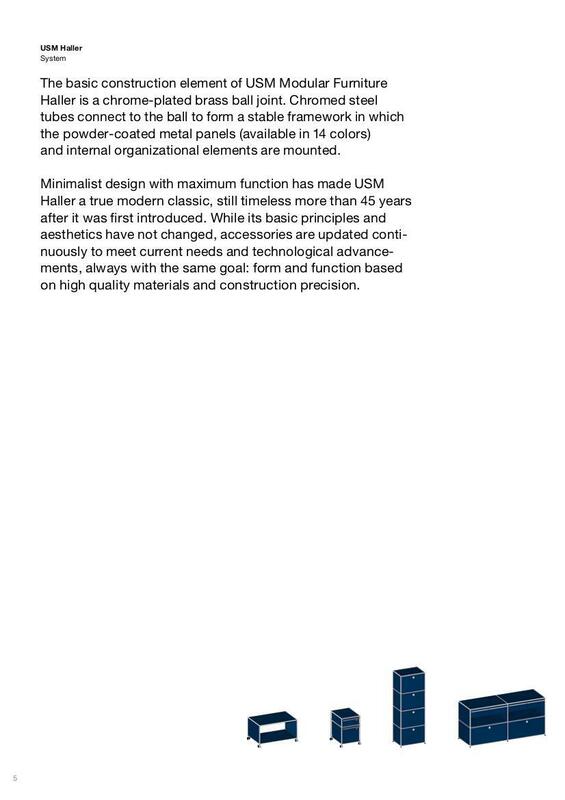 Six years later USM accepted an order to equip the Rothschild Bank in Paris, an order which marked the beginning of the serial production of System USM Haller. And its triumphal march through the offices of the globe. 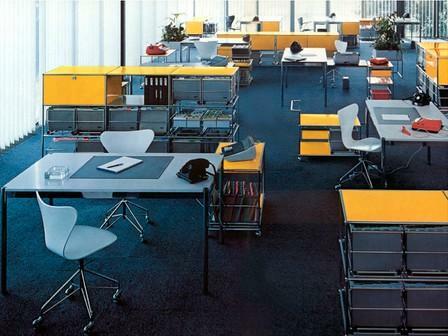 Wit its minimalist and modular nature System USM Haller was genuinely revolutionary in the 1960s. 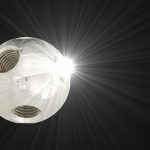 Consisting of just three basic elements USM Haller units can be adapted to fit any requirements and all spatial situations: and can subsequently be modified and extended again, and again, and again. 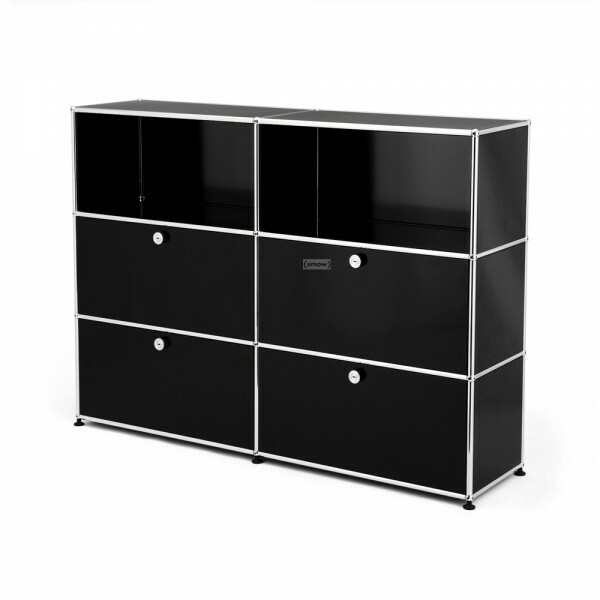 A USM Haller sideboard can optionally be equipped with open compartments, drop-down doors and extension doors. 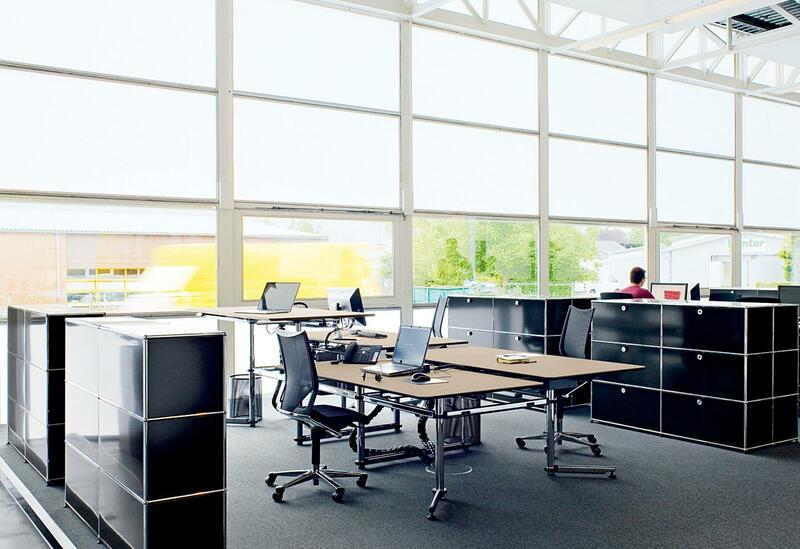 One of the first offices to be furnished with System USM Haller. In 1885 Paul Schärer's grandfather Ulrich Schärer founded USM as a hardware store and locksmith business. 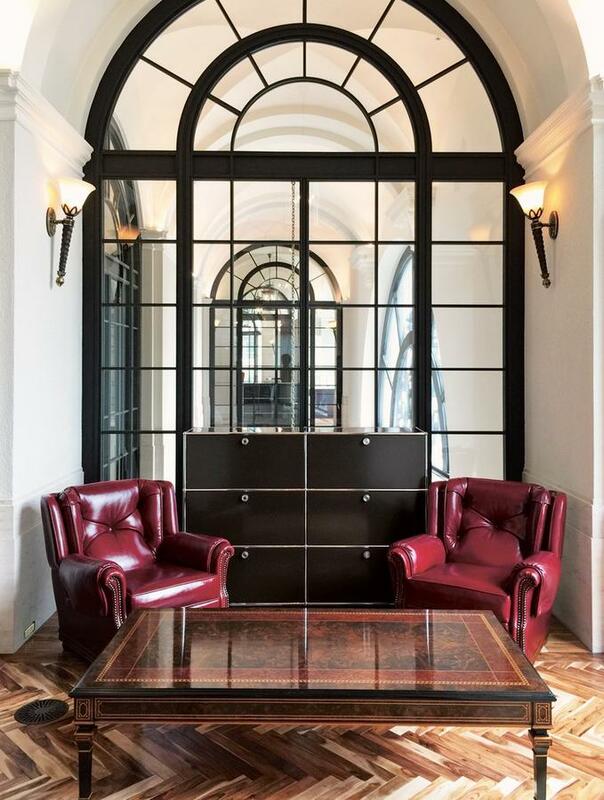 In the 1920s the company added the production of window fittings and in the 1950s sheet metal fabrication to their portfolio. 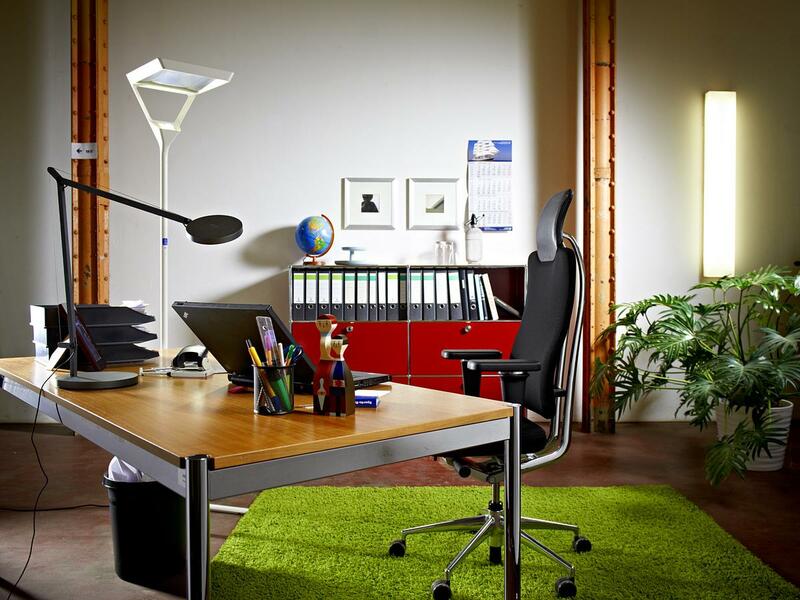 The manufacturer of the famous furniture system first occurred during the sixties. 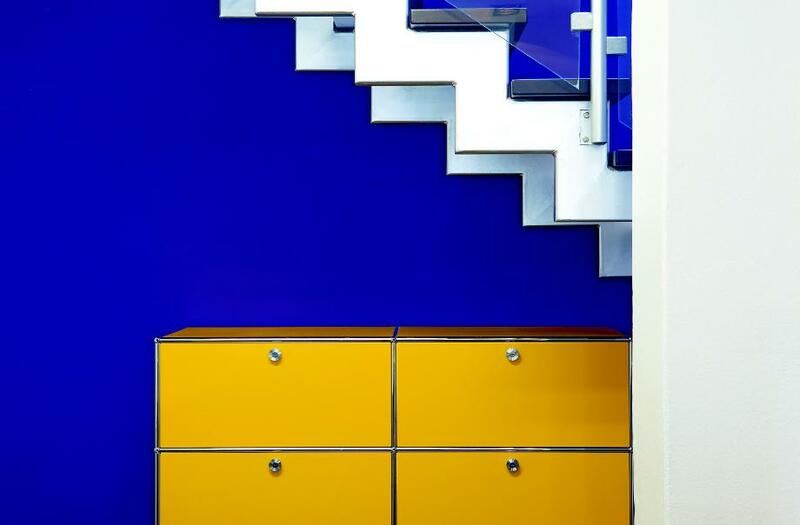 Paul Schärer wanted to transform the operation into a modern industrial company and in 1961 commissioned Fritz Haller to plan appropriate buildings. Including an appropriate furniture system. 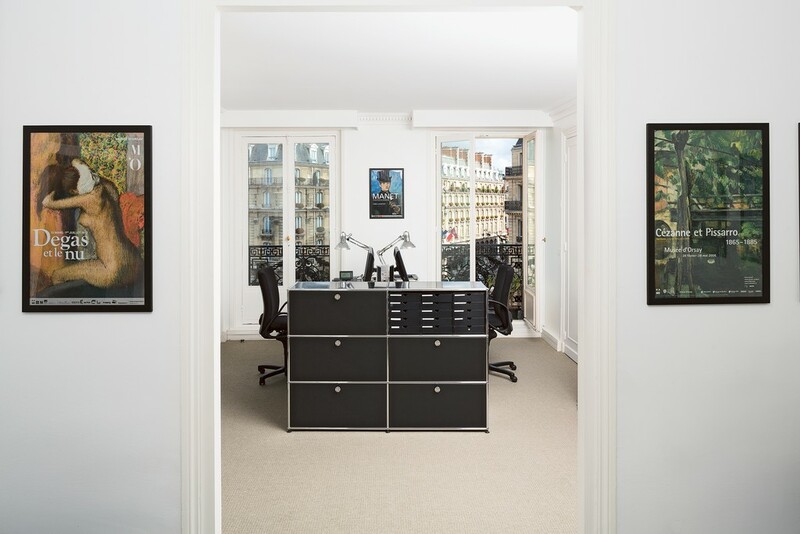 With the furnishing of the Rothschild Bank in Paris in 1969 began the real success story of the USM Haller furniture. 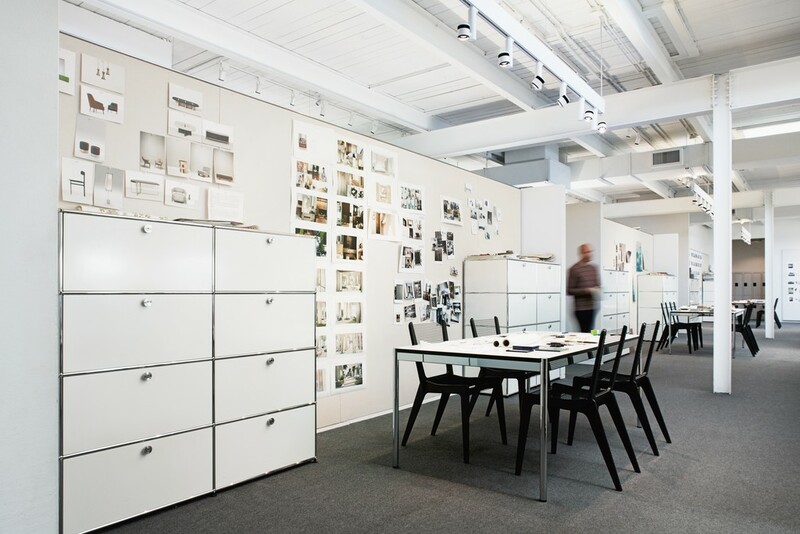 Since then USM Haller has become one of the most innovative and renowned furnishing systems on the market. 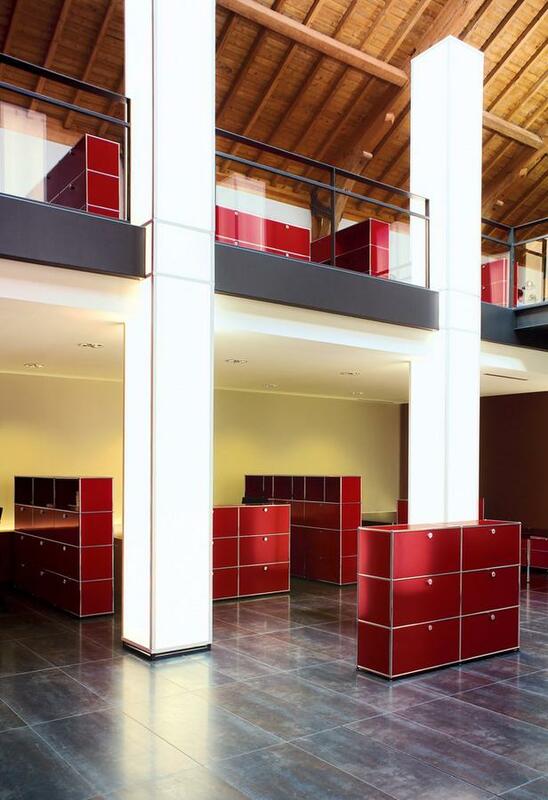 Since 1992 the company has focused exclusively on the production and development of USM modular furniture system. 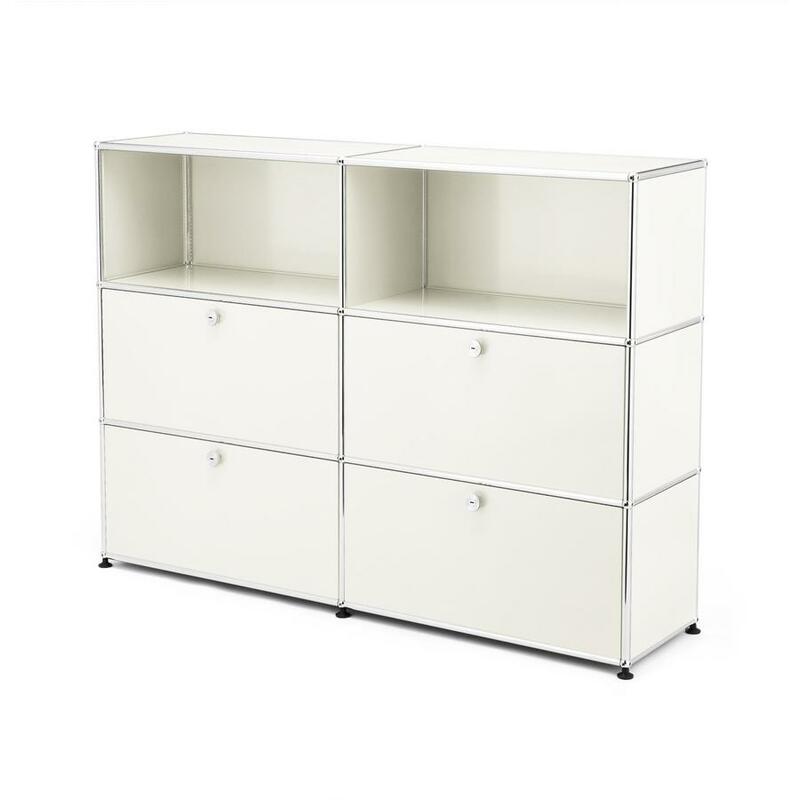 Just as the with his buildings so to can Fritz Haller's USM modular furniture system be understood in the context of functionalism. Based around the principle of "form follows function" the term functionalism was an important architectural and design theory at the time of Bauhaus and defines an object in terms of its functionality rather than the aesthetics. With system USM Haller despite the strict and minimalist design which gives the objects a modern yet timeless appeal, the focus is, was and always will be the function. 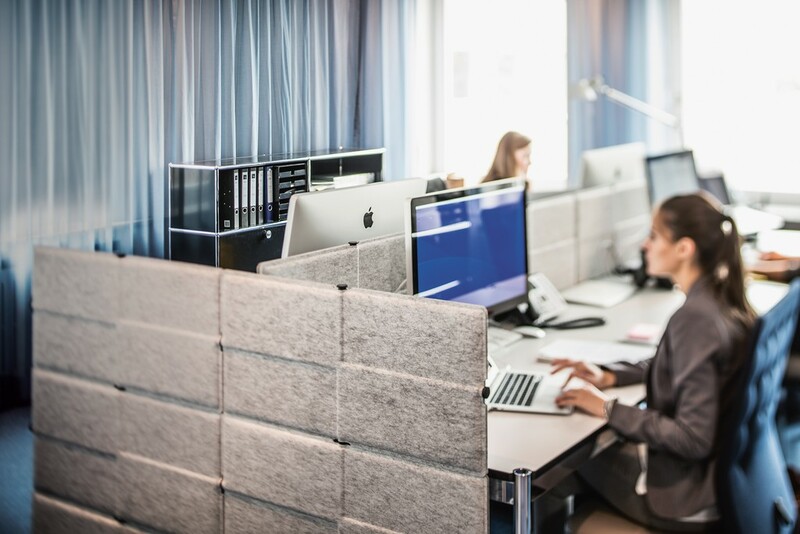 In addition the USM modular furniture systems effortless adaptability and variability underscores its functionalist claims. 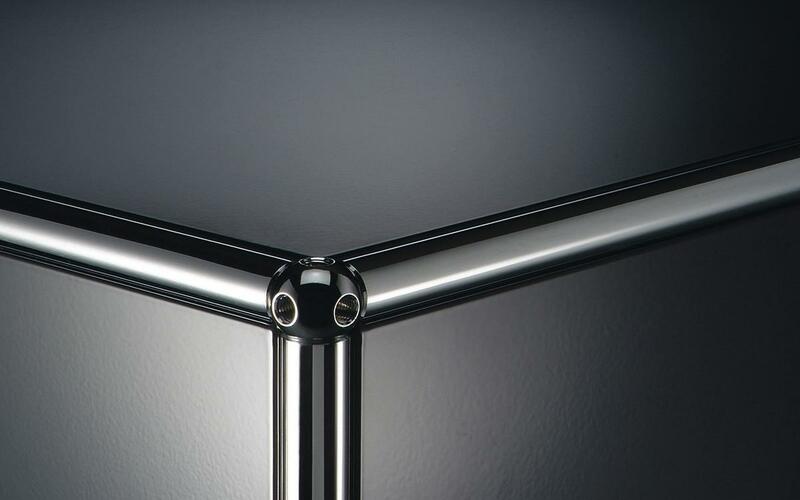 At its base in the Swiss village of Münsingen USM produce the chromed plated metal tubes for their systems structure, the chrome-plated brass balls which connect the tubes together, and the panels for "clothing" the structure. 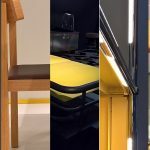 The cladding panels are powder coated and are available in fourteen standard colours, or on request, and by a suitably large order volume, any RAL colour. Orders for the German market are assembled at the USM facility Bühl, Baden-Württemberg. 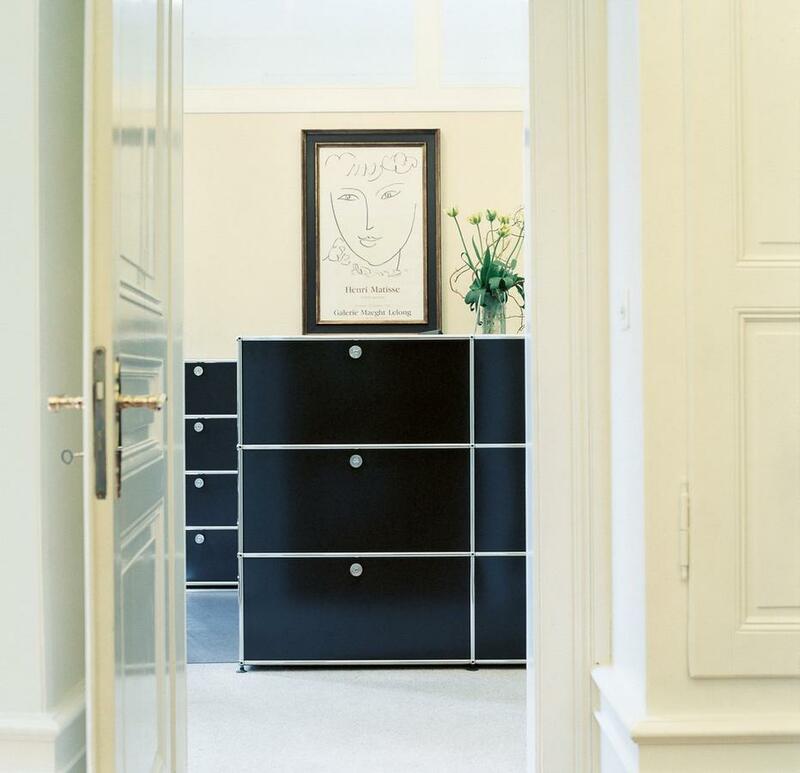 As USM only use high quality and durable materials in the production of the highboards, sideboards and filing cabinets, highboards, sideboards and filing cabinets which can be continually adapted to meet ever new situations, System USM Haller modular furniture is considered a sustainable and resource-friendly product. The USM base in Bühl is based on Fritz Haller's architectural principles. The Swiss architect Fritz Haller was born in 1924 in Solothurn. 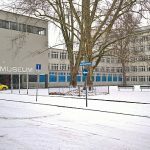 After training as a draughtsman and his architectural studies Haller designed buildings that are associated with the functionalism - most notably schools, workshops and office buildings. 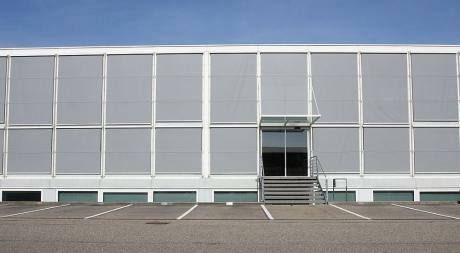 In 1961 came the contract for the planning of new production and administration building USM in Münsingen, Switzerland. 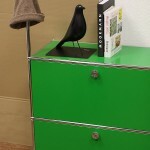 With the USM modular furniture system he developed for the new building Fritz Haller realised his only furniture design. And one of his most popular works. 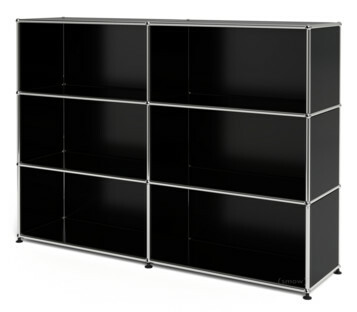 USM Haller shelves, tables and containers soon become classics of functional office furniture. 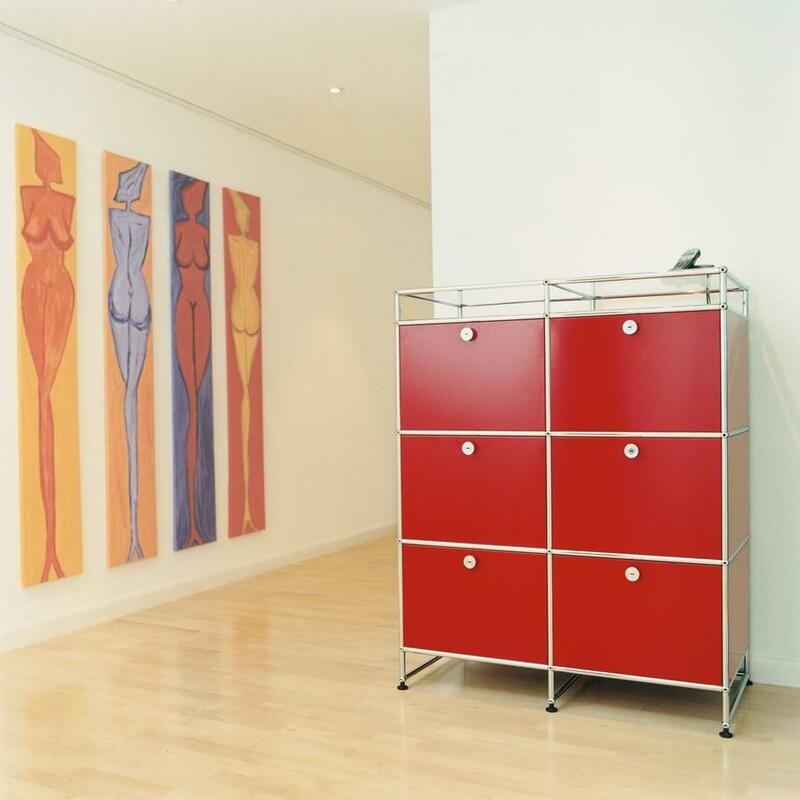 The USM design classics have won many awards and are now represented in many important museum collections, including the permanent collection of the MoMA in New York. Fritz Haller died in 2012 in his home in Switzerland.